One of the main reasons why I want a cottage is so that my family can get together there and enjoy swimming, fishing, playing, and eating. However my mother is not much of an outdoors type of person. Even though cottages have all the amenities of an urban home it tends to have more bugs then in the city and my Mom hates bugs. She hates seeing them and hates killing them. Even I’m not all that fond of squishing a giant spider or earwig in a piece of tissue. 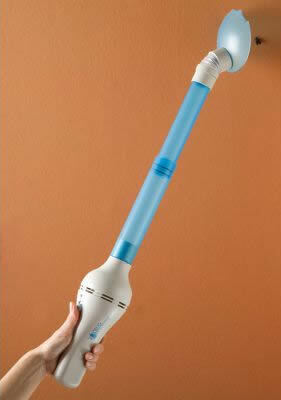 There is no need to get squeamish about bugs anymore because the Keep Your Distance Bug Vacuum has been invented. The cordless vacuum quickly captures bugs from up to 2 feet away. The insects are sucked down a tube into the handle where they are instantly killed. The extension tube can be removed so that the dead bugs can be dumped into the garbage. It’s quick, easy, clean and there is no need to get up on any stools or chairs to reach the ceiling. For $49.95 US it would be well worth it to have my mom enjoy herself at the cottage with the rest of us.